Did you know that the best way to cut brownies is with a plastic knife? I tried it and could not believe how much better it worked! I've had several people tell me that Maddie looks healthy. This is the nice way of saying that she is fat. Yes, at almost 16 pounds she is definitely getting enough to eat. Even though I promised myself that I wouldn't get into this season of American Idol, I have fallen in love with David Archuleta and Brooke White. It's taken me this long to realize that the tune to "Head, shoulders, knees and toes" is the same as "The wheels on the bus." Reese's Snacksters are my new favorite afternoon treat. I still can't get over the fact that they are only 100 calories per pack! I have started using my straightener on Sadie's hair. It looks so cute! Plus, after I'm done she always says she looks like a princess. Going to bed last night at 8:30 felt great. Hey, Jensen and Maddie can be "healthy" together. He was tipping the scales at 15 lbs last we checked! I love chubby babies!! Ok I too am obsessed with Idol! I luv david and brooke too- Im guessing you knew they are both LDS! So um were coming to utah in a few weeks- I even think steven farewell is the same time- so I hope I can meet lil Maddie! I'll have to try the Reese's thingees. Anything with that name on it has got to be good. Just finished singing the two songs and you are right. Man I have been tricked my whole life! 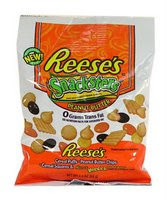 I am going to try those Reese's Snacksters. I love Reese's!